Crayola Story Studio Cars 2 will allow you to turn a photo of yourself into a Cars 2 picture and appear in the pages of a Cars 2 adventure. Then print, color and bind your pages in a real storybook. Full online access code allows kids to easliy morph photos of themselves into princesses and insert into a real Cars 2 adventure! Fisher Price Apptivity Cases! Brilliant! WHY have none of you EVER told me about these??? HUH?! Whoever is the brilliant person over at Fisher Price, I give you a high five! If you have a iPad, iPhone, iTough, Kindle etc. and you are tired of your little kids DROPPING your stuff, or getting them all smudgy, this is the answer! For me anyway, I am not about to stop handing them my phone or take the iPad away at home when they are allowed to have it. These will save some wear and tear! 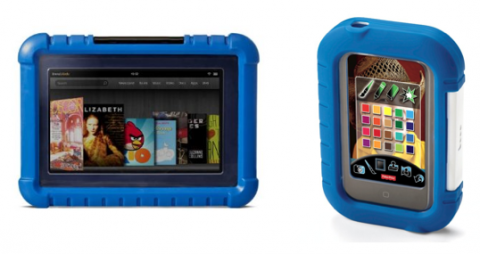 If you are looking for some thing for the older kids, Fisher Price also has these cases for the iTouch and Kindle Fire. They do come in pink also. Remember you can get the Kindle Fire Case FREE with the purchase of a Kindle Fire while they are on sale right now. Amazon deal of the day is a great one on a really cool camera!!! You will be getting more then 50% off a Sony Cyber-Shot DSC 4x Optical Zoom for $149 (was $329.99) + free shipping! Tiffany has had a Sony NEX 5n since this spring. She has always been Nikon loyal but could not carry around her big camera any longer. She has been really impressed with her Sony and loves it! After shipment of your purchase, you will receive an email indicating that a $2 credit for Amazon MP3 has been applied automatically to your account with the purchase of this camera. **GONE**Still Need a Present for Dad? Hot Amazon Ladder Deal 61% off! This is an incredibly good deal on this Little Giant RevolutionXE 22-Foot Multi-Use Ladder at only $199. The cheapest I saw it anywhere else was around $450.00! the Retail price on it is $600! I actually own this ladder and bought it when I was a claims adjuster for Hurricane Katrina. This is an really sturdy high quality ladder and is easy to adjust. If you are thinking about getting a new ladder this is a great deal. Imagine…a world of action & excitement where you decide what happens next! Now, imagine that world is the Disney•Pixar Toy Story movie, and you’re at the Pizza Planet with Buzz Lightyear, the Aliens and Zurg! There’s a working claw machine (just like the movie), a rocket ship and more! iIncludes Pizza Planet, Buzz Lightyear, Alien and Zurg figures, asteroid and rocket ship with projectile. The deal of the day today on Amazon is for Assassins Creed lll for PS3 and XBox 360. It was $59, they have it marked down to $33 + free shipping! PLUS, you are going to get possibly 3 $3 Amazon credit. Receive a $3 Amazon Instant Video Credit, $3 Digital Games Credit, and $3 Trade-in Credit with your order of ACIII on PS3 or Xbox 360, read more HERE.